The Viscount Range Bath Shower Mixer with Small Handset, this perennial favourite collection of basin taps and bath shower mixers capture the aura of a bygone time. Using high quality chrome and brass, these taps and showers will ensure many years of trouble free use and enjoyment. Hello, The instructions state the HOT feed must be on the left as you look at. The thread for this tap is a G3/4 which is 26.441mm under British standard production. Great service purchased with confidence. Haven't installed product yet but all looks good. This item complements my free-standing tub. The shower head makes it fun and easy for the children when they wash their hair and for quick rinses* in general. 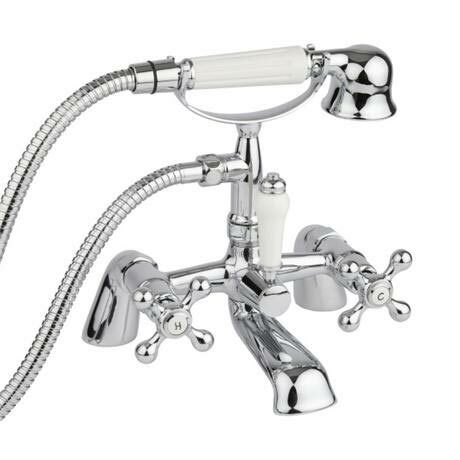 viscount range bath shower mixer with small handset-chrome-x384"
I absolutely love these, it has transformed my lovely original cast iron bath and made it look amazing. They are good quality solid weight and have transformed my lovely bathroom.